TWO Is For Couples, Get It? 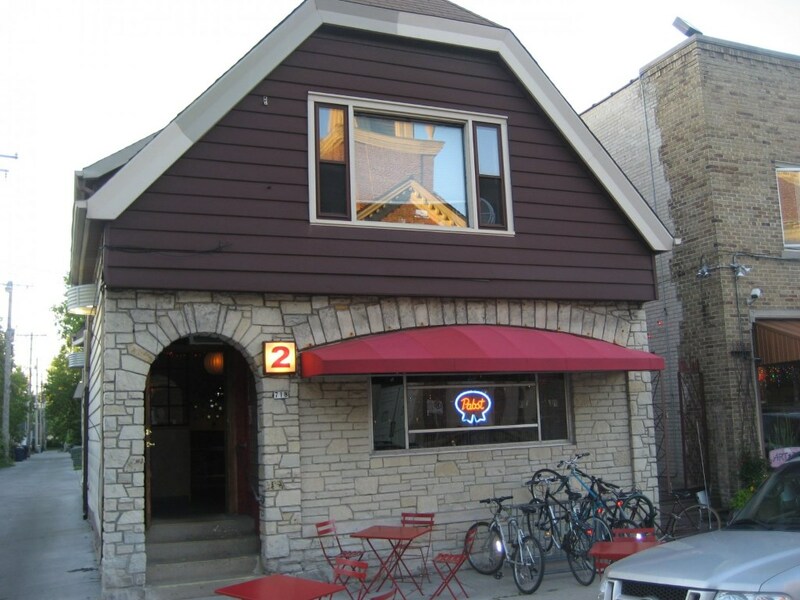 Yep, the former Riverwest tailor shop is a tavern with intimate booths for TWOsomes. TWO. Photo by Michael Horne. TWO is a twist on the singles bar phenomenon: the gimmick here is that you’re supposed to already have a date accompanying you to this intimate space, and who will remain with you throughout the course of the evening, indeed, for as long as you both shall live. In my personal state of affairs, such a twinned condition is inconceivable to the point of absurdity. That any one of my friends would consent to pose as my mate for a brief visit anywhere in public might be considered the febrile imaginings of a lunatic, so I didn’t bother to ask. In short, this trip will be TWO for one. This tiny tap with a 1001 square feet of space was originally constructed as a one-story cottage in 1909 for W. Zimmerman and his family at a cost of $2,300. Over the years it acquired some nice acoutrements, like a Lannon Stone front, and a bungalow-style second floor that was added in 1927 at a cost of $10,000 for Frank Wisniewski. Back in 1930, when this place was owned by Walter and Hattie Kowalewski, the front half of the first floor held his tailor shop, while Hattie ran a confectionary in the back. They lived back there and upstairs. In 1934 Kowalewski found that the tailoring business no longer suited him, so he turned the place into a tavern, and a tavern it has remained ever since under a number of operators, opening in 2008 as TWO, under the same ownership as the Art Bar, next door. 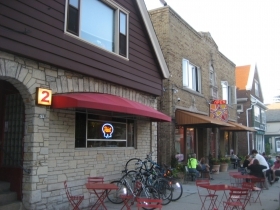 This bar is a classic “one in the middle of the block” kind of tavern that was once found in abundance in Riverwest, and not just on busy commercial streets, but in quiet neighborhood outposts like this one. Church just across the street from TWO. Photo by Michael Horne. E. Burleigh St. is mildly sleepy here, but this little area near N. Pierce and N. Bremen streets offered neighborhood commercial services over the years. 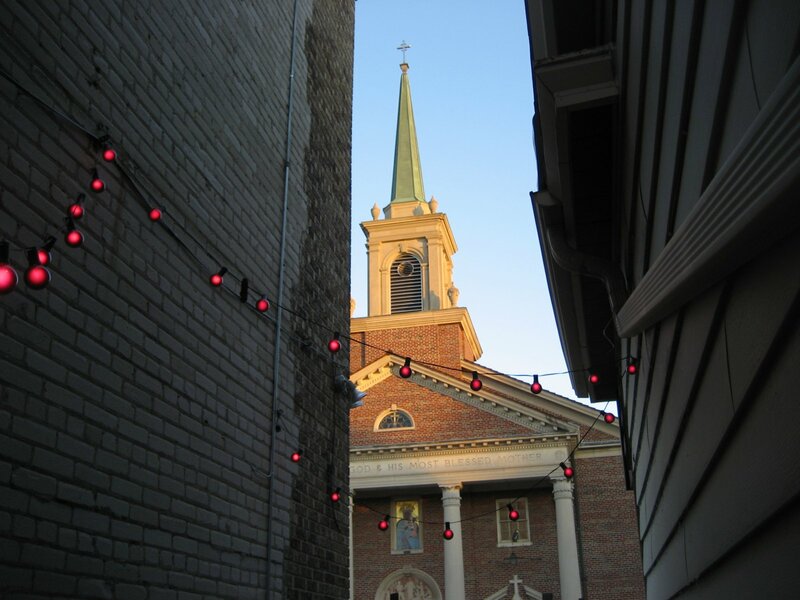 The thing that makes the tavern particularly interesting is that it, and its neighbor tavern, are located directly across from a church building, St. Mary Czestochowa campus of Divine Providence Parish. Although forbidden by zoning codes in nearly every other city in the nation, this church-and-tavern arrangement was considered an asset to a neighborhood in this city, making it much easier to grab a beer at the bar after mass, and catching the bakery next door before it closed for a pound of ham to bring home. In fact this setup was ideal for church ushers, who could grab a beer before mass, and then slip out the door to down another after they took the collection and the priest was still doing his services. 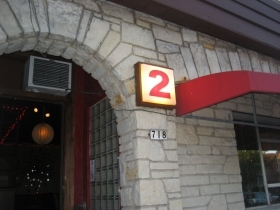 The entry to the bar is on the west side of its south wall, in a nicely framed space, surrounded by rough-dressed Lannon Stone, and next to an illuminated sign that reads “2”. The remainder of the facade at the street level is more Lannon Stone with smooth-dressed limestone surrounding the fluted-glass window that was installed in 1954, replacing an earlier, larger window that dated to the building’s use as a tailor shop. There was no need any longer to hang suits in the window, after all, and who needs a whole lot of light just to drink a beer? Inside, it is predictably dark, with the lighting provided by old lamps, strings of decorative lights and other whimsical conceits. The only neon here of any consequence is the Pabst sign that hangs in the window. Neon, we all know, kills the romance. Passion rarely flows where neon glows. So, things are dark and intimate here. 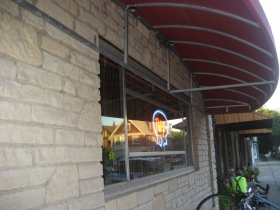 The bar is 20-feet long, and is set out seven feet from the east wall of the building. 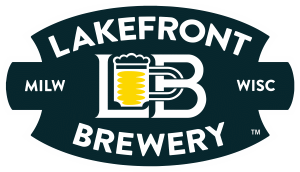 Here you can sit and look at the backlit bottles of fancy booze, or spend some time reading the beer list, or the wine list, which are on separate chalkboards on the wall. Behind the bar is some vintage paneling, some smoky mirrors, a few louche illustrations, and a bunch of light fixtures and decorative appurtenances such as you might find in the domestic interiors of Diane Arbus photographs, or John Waters films. If you and your date do not want to sit at the bar, then find your way to the numerous booths here, and sit behind red velvet curtains or strings of beads which sparkle with light. Weather permitting, go outside to the deck between this place and the Art Bar, and admire the decorative iron work there. 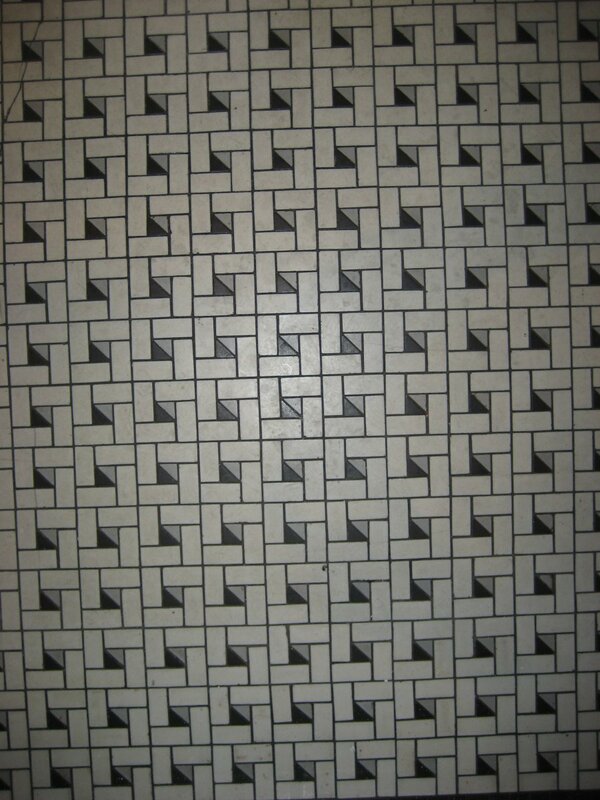 Bathroom floor. Photo by Michael Horne. Maybe even run over to the Art Bar, play a quick game of pool and make it back to TWO before your partner knows you’re gone. This “until death do us part” does not mean every single minute, does it? Perhaps, just meditate on the church across the way. This is the most Presbyterian-looking Catholic Church in the country, in my opinion. Maybe some of the Art Bar couples can come over and discuss comparative Polish liturgical architectural styles of the late 19th and early 20th centuries. At some point, you and your mate will have to split up, if only briefly, for a visit to the bathrooms. These are still denominated as Men’s and Women’s rooms. They were installed, along with some other building improvements, pursuant to a permit granted September 27th, 1938. 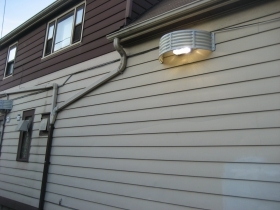 You may be assured that the fixtures and the flooring are original to that time. 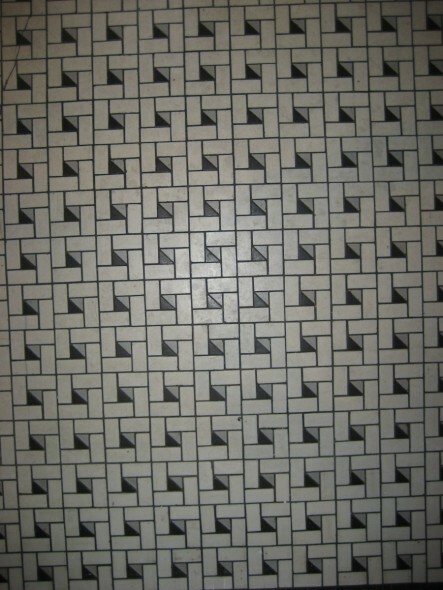 This is the sort of bathroom floor that is laid in black and white tile in an optical illusion pattern that used to transfix me as a child on trips to my grandmother’s home, where I could barely manage to leave the bathroom, so enthralled was I with the images that danced in my head while gazing at the floor. This was especially true after I discovered LSD. See for yourself, and take a trip to TWO. Bring a date. Description: Old house and former tailor shop has been a bar since the end of prohibition. 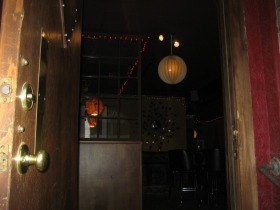 After a period of decline, the cozy spot opened as TWO in 2008 as an intimate place for couples. Beaded screens provide privacy for booths. Sit at the bar and look across the street at St. Mary Czestochowa, the most Presbyterian-looking Roman Catholic church building I have ever seen. Signature Drink: Something we can share, of course. Year Building Constructed: 1909 as one-story cottage built for W. Zimmerman at a cost of $2,300; 1927, additional story and alterations; 1934 remodel front tailor shop for tavern; 1936, expand to entire first floor; 1938, new men’s and ladies rooms; 1949, build two dormers, convert upstairs rooms to 2-bedroom apartment with bath and kitchen; 1954 stone veneer, fluted glass window on front (existing); 1956, 12-foot by 14-foot canopy with railed porch on north wall. Estimated Annual Rent: 1,001 square feet at $7.21/s.f.=$7,217 per annum according to City Assessor’s calculations. Property is assessed at $4,300 for the 1,800 sq. ft. lot [$2.38/sq.ft.] and $86,300 for the 2,002 sq. ft. building for a total assessed valuation of $90,600. Owner purchased property July 3, 2003 for $123,333. Property taxes of $2,538.88 is Paid in Full. Property Owner: Burleigh East, LLC, Jerry H. Bellin, Registered Agent. Business Owner: ACD Production LLC Agent Donald R. Krause [D.O.B. 08/03/1960] 100% owner. Games of Chance: Give romance a shot, and see how well you do. County Supervisor District: 13th, Supervisor Willie Johnson, Jr. Fascinating. How is it I never noticed this place despite going to Arts for years? I’ve never been to Two (and did you find it uncomfortable to be there as One, Michael Horne? ), though I’ve often been to Art Bar. Interesting article and interesting history of the site (and I love the photo of the church peeking out beyond two buildings)!